Every species on earth exhibits a wide range of biological cycles that repeat approximately every 24 hours. These are known as circadian rhythms (circa – approximately; dies – day) and are exhibited at every level of biological systems, from timing of DNA repair in individual cells to behavioral changes, like the sleep-wake cycle. Civilization has changed the natural light-dark cycle that humans experience. Buildings shield us from the weather as well as the bright daytime sky. Electric light sources not only provide illumination at night and throughout building interiors, they also provide self-luminous displays such as televisions and computer monitors. Epidemiologists and other medical researchers have expressed concern over electric lighting as a potential disruptor of the natural light-dark cycle; a wide range of maladies from insomnia to breast cancer have been statistically associated with disruption of the natural 24-hour light-dark cycle. Considering the significance of the light-dark cycle for regulating biological functions, and the accumulation of evidence from epidemiological and animal studies linking circadian disruption to compromised health and well-being, it is surprising that so little has been done to quantify light and dark in industrialized societies as they might affect the human circadian system. Given this paucity of photometric data, it is perhaps not surprising that so little has been done to parametrically study the impact of circadian disruption on health and well-being in people. However, without proper photometric data it is essentially impossible to draw valid inferences about the impact of lighting, both natural and fabricated, on human health and well-being. A published model of human circadian phototransduction (i.e., the conversion of optical radiation incident on the retina to neural signals) was used to estimate levels of circadian stimulation from four typical outdoor light sources as might be experienced by people under different realistic scenarios. The approach taken was to determine whether sufficient light is incident on the retina to reach a working threshold for stimulating the circadian system and, thereby, to ascertain whether and to what degree outdoor lighting might stimulate the circadian system, as measured by melatonin suppression. 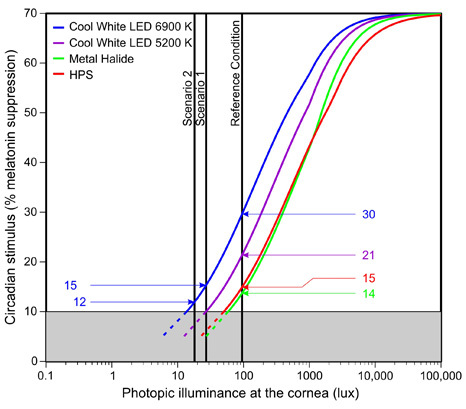 Estimates of irradiance levels at the cornea from two commercially available “cool-white” LEDs, a sodium-scandium metal halide (MH) lamp, and a high-pressure sodium (HPS) lamp were considered for three different conditions: a reference condition similar to what has been employed in controlled laboratory conditions, and two practical scenarios that could occur with an outdoor lighting installation. From those irradiances, and assuming a one-hour exposure with natural pupils, it was possible to estimate the degree to which the circadian system of a 20-year old would be stimulated, defined operationally as percentage of nocturnal melatonin suppression. Reference condition and two lighting scenarios used to calculate effective circadian light stimulation for four light sources. Calculations of circadian stimulus for the four light sources under each of the three conditions were made following a previously published method (see full paper for details). Under the practical application scenarios examined here, three of the four sources examined would not meaningfully stimulate the human circadian system after one hour of exposure, while one source (a 6900 K LED) is predicted to have a modest stimulating effect after a one-hour exposure (corresponding to 12 – 15% nocturnal melatonin suppression). For the reference condition emulating a laboratory experiment, melatonin would be suppressed by 15% for the HPS source, 14% for the MH source, 21% for the 5200 K LED source, and 30% for the 6900 K LED source. Melatonin suppression (%) by the human circadian system in response to two “cool-white” LEDs, metal halide (MH), and high-pressure sodium (HPS) sources plotted for a wide range of corneal photopic illuminance levels. Although the information presented represents a state-of-the-art analysis of light-induced nocturnal melatonin suppression, there are several limitations to this analysis due to the uncertain causal relationship between retinal light exposure at night and human health. We are coming closer to a quantitative understanding of how light affects the circadian system, but we still do not fully understand if or how light at night might affect human health through the circadian system. A reasonable and conservative working threshold for suppressing nocturnal melatonin by light at night following a 30-minute exposure would be about 30 lx at the eye for a “white” light source. This working threshold is based upon the determination of a reliable degree of light-induced nocturnal melatonin suppression of 15% or greater. 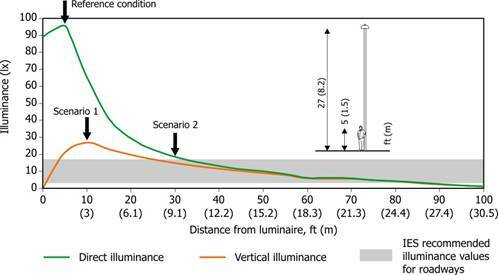 As shown in the figure above, any given threshold value (10% for this analysis) will show that different light sources, depending upon their spectral irradiance distributions, will require different photopic illuminance levels to be considered above or below that threshold value.